Blue car owner Bill Duckton, who had left the vehicle parked outside of Blue Green Power Plant World Headquarters while he was away on his journey to the Center Of the Earth, has reported that he received an anonymous call about the whereabouts of his missing car. 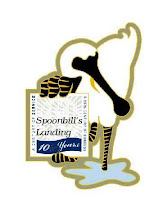 The anonymous caller led Duckton, along with a contingent of local police, and the Odd Prowler tagging along, to a garage in the "Spoonbill's Landing" condominiums, where Duckton identified his car. "That's my car. But what the...Where did this scratch come from?" he announced. The parking space was registered to Blue Green Power Plant colleague, Bill Dafferty. Hey, I live in those condos. What the heck is going on? This used to be such a nice place. What's the weather like out there in Florida?